On a steep bush block next to National Park, every rock outcrop and tree was surveyed and planned around, and temporary scaffold set up to ensure ocean views at all levels before designing. Stretched along the spine of a ridge with ocean glimpses either side, a series of pavilions form a village of shapes and vistas. Like a marine container or a lighthouse at night, designed to weather the elements from without and capture views for a multi generational family. ...but at street level there is no view, so no picture windows to the street but to the north with deep eaves and concealed garage doors, the views open up at higher levels and light cascades down the stairwell. …with views across a public reserve to the lake, privacy and views were both design considerations. Mandatory elevated floor levels allowed for an above ground pool. 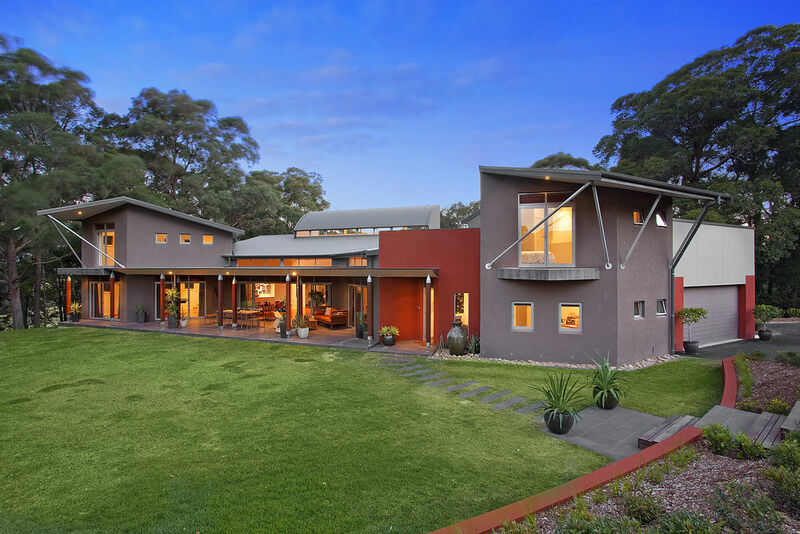 Attention to detail by a master craftsman owner resulted in a crisp contemporary finish. Past an 18m lap pool, the colonnade opens up to the beach with outdoor living at all levels- privacy from the street, sunny courtyard, ocean views and protection from the southerlies. A light house with strong design and beach aesthetic. Major excavation was required to achieve on site parking with a lift over three levels and spectacular views from dramatic cantilevers and roof top pool.